As an avid lover of all things metal, it’s fair to say that I’m familiar with every genre you hear being thrown about in conversation. And I’ve had the distinct pleasure of witnessing some phenomenal shows to date. That said, absolutely nothing can prepare you for the aural insanity that is Igorrr – either on record or in a live capacity. In a nutshell, Igorrr is the eclectic brainchild of French musician and composer Gautier Serre, who makes music with zero boundaries or restrictions. Imagine a huge shindig with metalheads, electronica enthusiasts, classical-heads and gypsy violinists getting drunk and coming together and you’re on the right path. And with fans in all number of places (from Europe to the far flung reaches of the Middle East), people are embracing a new musical movement – Baroquecore – in all its beautifully batshit glory. This evening is date two of the Savage Tour’s UK leg, and Birmingham’s The Flapper looks set to be titillated by the intensity of these French fusionists. Combining dark theatrics, exuberant electronic flourishes and operatic poise, Northampton natives Denigrata take their audience on an immersive journey. Tracks from full-length début Missa Defunctorum scream with both confidence and cohesion despite the numerous changes in style and dynamics. Dual vocalists Denigrata Herself and Manea are visually resplendent – decked out in ornate antlers and macabre corpse paint – segueing seamlessly between larynx-splitting shrieks and searing melancholy – the latter capable of reducing the most stoic bystander to a giddy heap on the slick floor. Meanwhile, synth-driven beats and cacophonous shredding transform this performance into a nihilistic, modern-day black mass. The startling contrast of cold, clinical industrial samples alongside evocative melodies invokes the feeling of being delicately stroked yet punched in the face simultaneously; this calculated chaos works in the band’s artistic favour. A fresh and scathingly sublime set from an act that scream with promise. The mercury has reached inexplicable levels by the time Igorrr hit the stage, and the venue’s cramped basement space is teeming with perspiring bodies. Revered (and undoubtedly curious) silence falls as Laure Le Prunenec’s flawless operatic vocalisations ring out, causing uninitiated mouths to fall open and our collective attention to be grabbed from the offset. Delicate, folk-tinged strains are greeted by roaring cheers, which rapidly give way to pounding blastbeats and guttural shouts courtesy of male vocalist Laurent, whose painted body and eye-popping intensity borders on menacing when juxtaposed against swirling pirouettes and flowing arms. Convulsive rhythms collide with rumbling bass lines as the aural schizophrenia of ‘Opus Brain’ and Venetian Snares-esque breakcore-spliced ‘Biquette’ momentarily transforms The Flapper into a mid-90’s rave; collective limbs flail gleefully to a barrage of abstract noise and hyperkinetic beats. 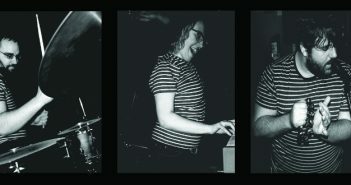 Chunky riffs and death grunts provide the respite for anyone chasing heaviness, but it’s also impossible not to sway unashamedly to accordion-laden songs like ‘Cheval’, which entices the grinning revellers into a venue-wide singalong. 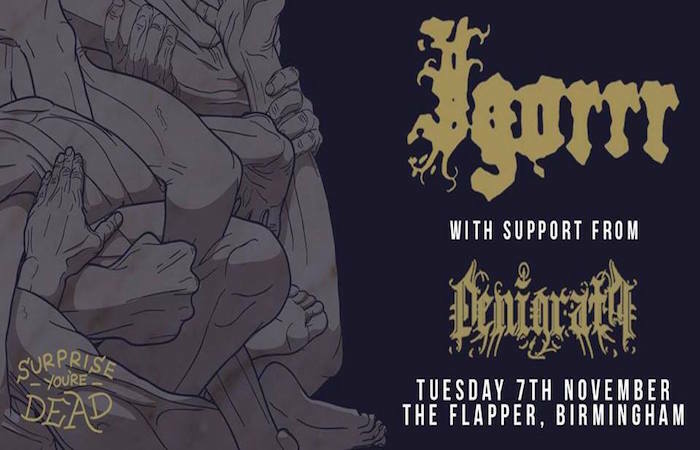 Take a bow, Igorrr – a live masterclass in heartfelt chaos that draws from the best of every musical genre. For further reading, check out Hera Vidal’s review of Igorrr’s album Savage Sinusoid and Catherine Fearns’ report of them live at Hellfestt.